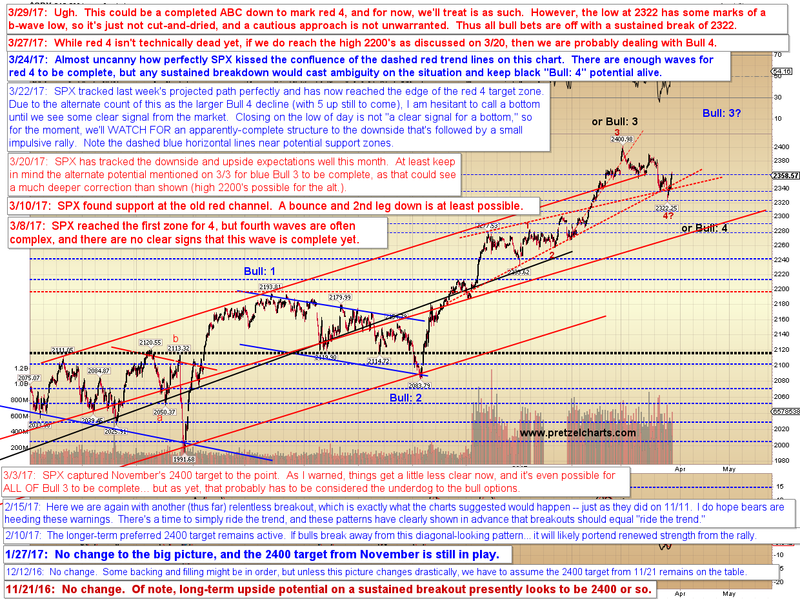 First off, it's entirely possible that the decline is a perfect ABC, to wrap up the anticipated red 4. The thing holding me back from calling the bottom with more conviction is the b-wave "look" of the 2322 low in SPX (and other markets). On the flip side of the coin, the thing holding me back from saying "That's a b-wave, so there's more downside coming!" is that earlier in the year, there were a few similar-looking "false b-wave" patterns that ended up being fully-complete corrections -- and the market never looked back. So I just can't say with certainty whether the correction is done or not. If it hadn't been for the "false b-waves" earlier this year, I would say it wasn't -- but since the market has been behaving differently in the recent past, that has to be respected. If we ignore the b-wave look, then we have a perfect 5-3-5 ABC correction down, which would suggest a completed decline. In conclusion, I find this to be a bit of a quandary, so you'll just have to decide for yourself which way to play it. On the one hand, I'd like to lean bullish based on recent market behavior and on the fact that if we ignore the "apparent b-wave," the pattern makes a nice ABC 4th wave -- but this is challenging for me, because leaning even slightly bullish goes against my philosophy of living by the sword/dying by the sword regarding the micro patterns (since the micro pattern in this case wants me to be bearish). In any case, obviously, any sustained break of Monday's low calls for significant caution from those of the bullish persuasion. Likewise, if we see impulsive declines forming, then we might heed those as an early warning. For the record, IF the recent rally was/is a c-wave, then it will end abruptly, and it already has enough waves up to be complete (though one more new high would be acceptable and might look better). This is just how it sometimes goes, especially after a long run of clear reads and captured targets -- eventually the market has to throw a curveball into the mix to keep things from being too easy. Hopefully, this situation will clarify further in the next few sessions. Trade safe.